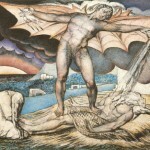 The Suffering of Job and the Answer of Christ. The Lenten series at our parish is focused on the problem of suffering and pain. The rector, Fr. Bill Midgett, felt like the Holy Spirit was leading hi to teach on this topic and the people of Trinity are responding. Last Wednesday night, our discussion turned to Job–to the challenge of Job and of the “Jobs” we are all aware of from our own lives and experience–the people who suffer for no apparent reason, whose pain not only taxes our emotional reserve and empathy, but offends our sense of righteousness, of rightness or justice. We all desire to see the wicked receive their just deserts, but we are offended when the innocent suffer. Even as it challenges us, the story of Job gives us hope as it describes the reality that evil really is unexplainable, that people suffer without reason, that suffering can’t be equated with punishment for sin. But there is another way in which the Book of Job works, that I haven’t heard or read about elsewhere. I believe we see in Job a foreshadowing of Christ, that there is messianic content in Job just as there is in other parts of the Old Testament canon. For example, consider the role of the devil as the Accuser, the prosecuting attorney seeking to prove Job unfaithful to God, to force his disbelief and thereby wrong an innocent man–to prove in fact, that Job wasn’t as faithful or innocent as he or God believed. And yet through all of his trials Job maintained his belief in God, believing even when he lashed out at him in anger at affliction. As admirable as his endurance was though, Job could only endure, he had no hope of triumph. There is no doubt that the story of Job is a troubling one, for even if Job never questions the existence of God, it is unclear that such a questioning would have even been possible for a pre-enlightenment person. Job doesn’t question God’s existence, but he does–and I think within reason, if not “justifiably”–question God’s goodness. And yet, God doesn’t allow the story of Job to form the entirety of what we know about him or about the devil. You see, there are parallels between Job’s story and the life of Christ. Just as the Enemy was fulfilling his role as the accuser in Job, seeking to destroy Job’s faith, he strikes out again at another innocent man in Jesus of Nazareth…but this time, the joke is on the devil. For while Job could only endure, Jesus had the power of God and could triumph. There are some interesting similarities and differences between the way the devil attacks Job and the way he attacks Jesus. For Job, the temptation is to blame God and believe him unrighteous and unjust–to “curse God and die.” For Christ, the temptations placed before him were about the misuse of his power and authority, twisting them toward the ends of the devil rather than the Father. Therefore, rejoice, O heavens and you who dwell in them! But woe to you, O earth and sea, for the devil has come down to you in great wrath, because he knows that his time is short! The devil has been defeated by Christ through his resurrection, his hold on humanity is at an end, and we are no free by grace to enjoy relationship with the Father. But because of his defeat, and the fact that he “knows his time is short,” the devil is ever more active in our world, bringing affliction on humanity…and yet, because of Christ we have hope, because of our salvation from sin. One of Job’s friends asked the question in chapter 14, “Who can bring a clean thing out of an unclean?” We now know the answer to that question is not “there is not one,” but rather, there is one, Jesus Christ, who has brought a clean out of an unclean by saving a wretch like me and every other believer… our robes have been made white in the blood of the lamb.